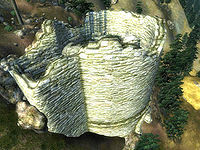 Fort Rayles is a medium-sized fort northwest of Chorrol containing conjurers. It contains two zones: Fort Rayles and Fort Rayles Hall of Winter. 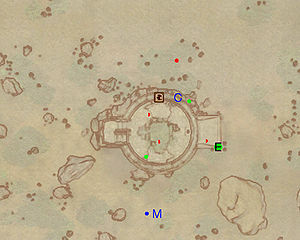 Fort Rayles also appeared in ESO. This location's map marker (M on map) is named Fort Rayles (editor name FortRaylesMapMarker). The entrance door is N of the marker, 130 feet away. Upon entering, you will face up to two Conjurers before arriving at the barred gates at K and L. In front of you are two stone statues with blue gems on their foreheads, as well as two very convenient silver arrows. Hit the gems and both gates will open up for you. 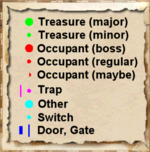 Head through the eastern gate; in the next room are up to two enemies, four bedrolls arranged on two bunk beds (b), a minor loot chest and a collection of alchemical equipment and books (E). In the next room you will face up to two enemies - try to use the arrow traps at F to your advantage. 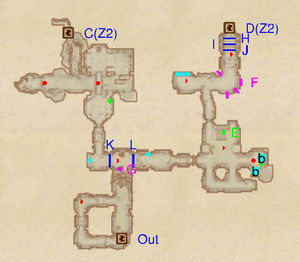 Three levers are on your left before the traps, each controlling one of the gates at H, I and J. Pull the middle lever to open the middle gate and proceed to the next zone from door D.
When coming back to this zone from the Hall of Winter, you will emerge from a wall dug into the wall of the fort. Defeat the enemy nearby and claim the repair hammer lying in the rubble. Climb to the upper level, defeat another enemy and loot the minor loot chest nearby before heading for the exit. If you entered from door D, loot the chest nearby and fight with the enemy guarding it. The commotion will probably attract at least one other enemies from the large room ahead. 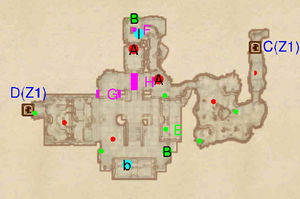 This area contains two boss-level Conjurers (A), one on the bottom floor and one pacing near the bridge above you. Once you've defeated them, head to the eastern side, avoiding the arrow trap at G. On a stone altar (E) you will find a full set of novice alchemical equipment, while on the one next to it lie a novice calcinator, a portion of bonemeal, a carved up zombie corpse and the offending steel dagger. There are also two minor loot chests, a bedroll (b) and a boss chest (B) nearby. Head up the stairs and pause just before the bridge. On the ledge to your right are a couple of bones and a War Axe of Jolts. You'll need to jump and make a grab for it. Once you've got it, head back up the stairs and across the bridge (H), taking care as it will collapse under you. Step around the broken grate at F and loot the boss chest at B. Nearby are an apprentice retort, a potion of feather, a copy of The Book of Daedra, a mages's robe and the rare matching hood. Jump down the grate, which will cause some damage, and you will come across a dead goblin (I) surrounded by bottles of beer. Leave your unresponsive drinking buddy and head into the caverns beyond. The next room contains up to two enemies and two minor loot chests. Return back to the first zone from door C.